PLANTanswers: Plant Answers > Tomato, Tasti-Lee™ Hybrid -- Bred for vine-ripe harvest and superb flavor. 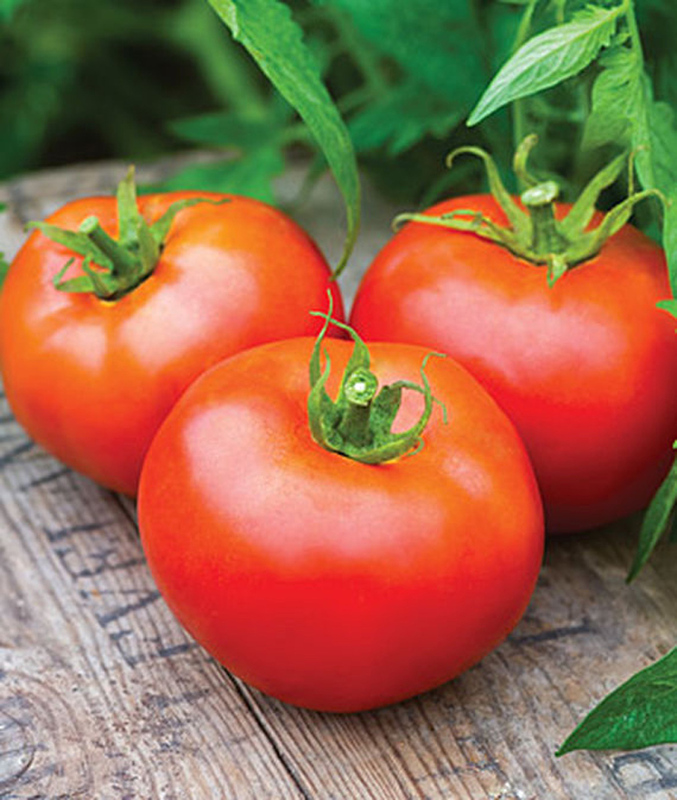 Plant Answers > Tomato, Tasti-Lee™ Hybrid -- Bred for vine-ripe harvest and superb flavor. Tomato, Tasti-Lee™ Hybrid -- Bred for vine-ripe harvest and superb flavor. Tasti Lee™ is a breakthrough because of the artful balance of sweetness and acidity, true tomato flavor and rich red color. Here's your all-star tomato, the 6-9 oz. fruits ready to rev up sandwiches, salads, sauces and salads. Loaded with health-giving lycopene-up to 40% more than other varieties. Determinate. If you’ve been in the produce section of Publix lately, you might have seen a bright-red tomato brought to the retail chain through the direct work at the UF/IFAS Gulf Coast Research and Education Center in Balm. The tomato, the Tasti-Lee, was developed by Jay Scott at the center and is meant to provide that “homegrown” taste consumers long for. Scott says the Tasti-Lee is a good example of developing a variety that has consumer appeal and pays off for the growers that are planting them. “I certainly hope this a good example of the public/private relationship of UF/IFAS working to provide a variety for growers that consumers are willing to pay a premium for,” he says. “Right now, the growers are getting high premiums for the Tasti-Lee that is even good for vine-ripe prices. Growers can make money and get a field-grown tomato back into the grocery store where we have lost market share to greenhouse tomatoes in the last decade. Finding the right grower partners also has helped the early success of this new commercial variety. “In the early days of developing a production and marketing strategy for Tasti-Lee, we had some difficulties in identifying the right growers,” says Styers. “Many growers were simply not convinced that we could produce this tomato without harvesting at mature green and gassing. There were a lot of what ifs. What if we have four inches of rain the day before harvest or what if we have to hold these tomatoes for a few extra days, or what if they’re not all extra large, etc. ?